The Colts are bad. They’ve faced a pair of excellent defenses in the Bills and Jets, but that doesn’t negate the fact that Indianapolis’s O-line is a sieve, the defense is a grab bag, and all-world QB Andrew Luck has been given aging, retread weapons. 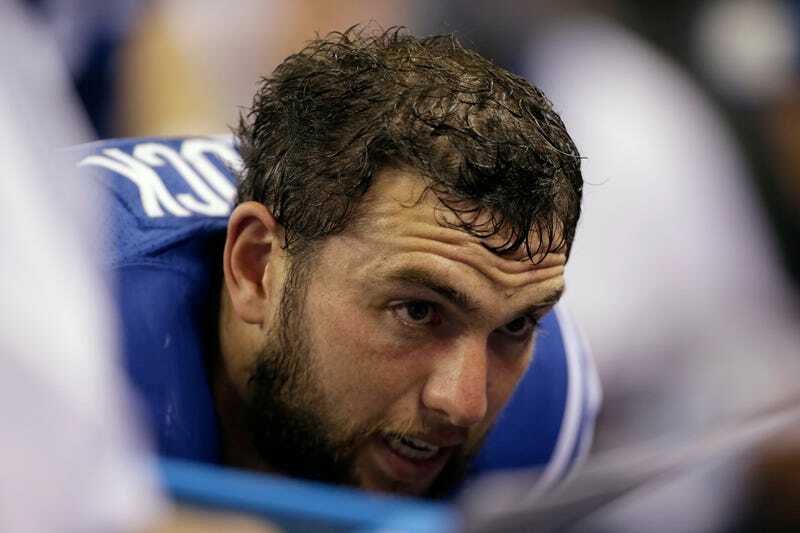 Luck, too, looked sub-replacement-level in last night’ 20-7 loss. Head coach Chuck Pagano saw what you saw, and he is fed up. Pagano isn’t an emotional guy, so he’s never going to reach Jim Mora “Diddly-Poo” levels, but his press conference following the game was as close as he’ll get to publicly throwing a chair across the room. No one was spared: not Luck, and certainly not GM Ryan Grigson, with whom he’s privately and increasingly feuded over the last year. Pagano and Grigson have never been tight, but this summer reportedly saw the rift between the two widen. The clash is largely over personnel issues—differences of opinion on who to sign. That’s fairly normal; the roster is the GM’s domain. But here it goes one further, with Grigson reportedly having a major say over lineup decisions. That’s historically the coach’s sole bailiwick, but Grigson is largely running the show in Indianapolis. And to further rankle Pagano, Grigson is doing so with the imprimatur of owner Jim Irsay. The Indianapolis Star’s Stephen Holder, who’s done the deepest reporting on the power struggle between Pagano and Grigson, says last night’s press conference could be a sign of things to come. The AFC South remains putrid. The Colts should still take the division. But if they don’t (and even if they do, then bow out meekly in the playoffs), Pagano and/or Grigson could be out. Both are in the last years of their contracts, and that’s telling enough: teams tend not to let their coaches and GMs reach lame-duck status. The interesting part is who would take the fall. The players adore Pagano, sure, but those are the same ineffective players that have the Colts in this mess. This is a team that could stand to be completely blown up while Andrew Luck is young enough to be rebuilt around.